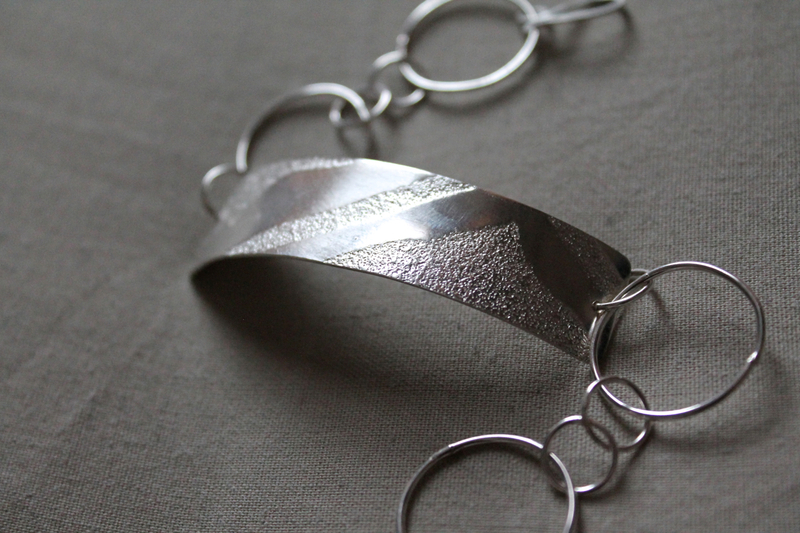 Hand bent and hammered clasp! I’ve fashioned two silver rings, two pairs of earrings, a copper keyring, and ended the beginning silver class on a high note. 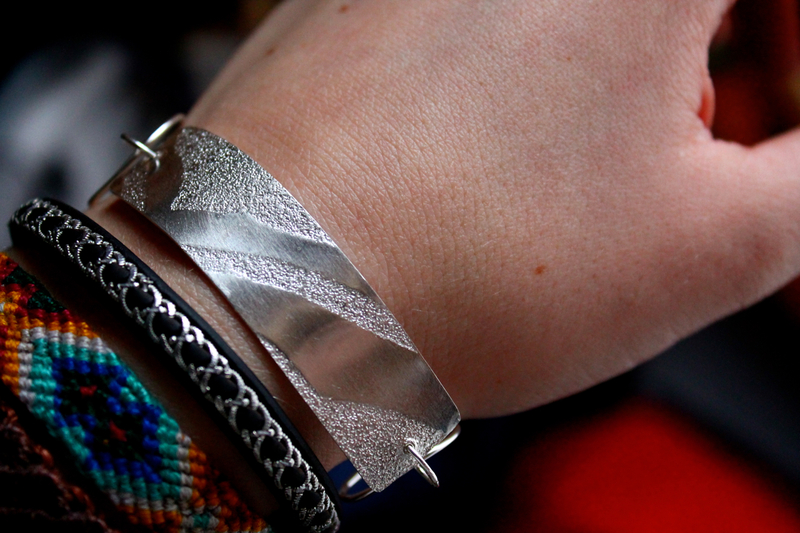 This is the silver bracelet I made over the last two weeks. I made the whole thing: pierced the jump rings, soldered them with a blow torch, textured the band. 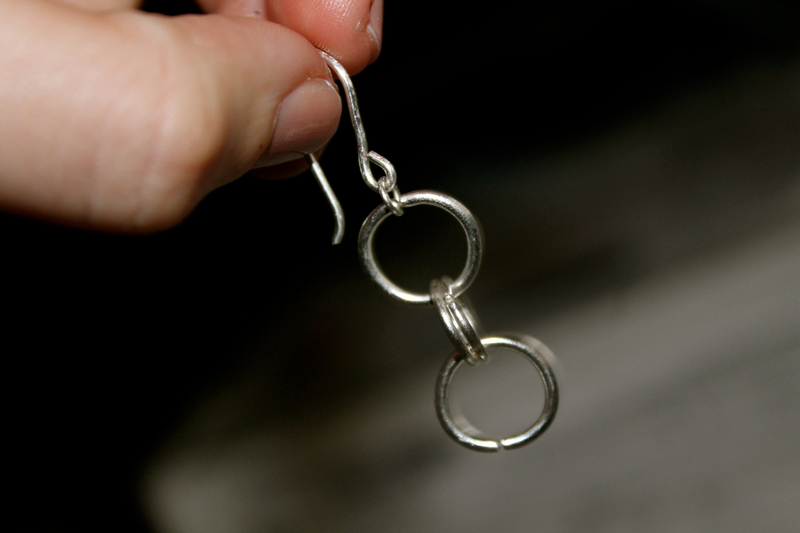 Caught my fingertip painfully under the hammer while I flattened the clasp. Built the very beginnings of callouses from filing edges on my hands. Miraculously managed not to burn myself even once on the hot metal. This beginning silver class was the best thing I could have done for my sanity, given the backdrop of my MA. I’m planning to write more about it soon, but in a sentence: It’s frustrating. I’ve never worked so hard for so little. I sit for hours without moving, puzzling over predicate logic and ellipsis. No movement. No progress. No fun. First-order predicate logic, from Wikipedia. Note the annoyingness. My body is aching from sitting around concentrating in vain on annoying things. It’s difficult; as far as I know at the end of this course I will be one of the best-educated women in the history of my family. I have this massive opportunity to learn, and the incredible luxury to be a full-time student. I’m coachable;tell me how to be better and I will do it. I have always loved school. I just can’t love this MA. Today I have to go to a meeting with the staff of our department and represent those on the MA programme. The words used by those I’ve spoken to in the last few weeks match my own feelings with creepy accuracy. We don’t know how to work harder, much less smarter…and everything that we thought we wanted from an academic career or had the hubris to believe we were good at is cast in a distinctly mediocre light. For someone who has defined myself as an aspiring academic, and a decent one at that…it’s hard to keep my footing on the rapidly shifting ground. It’s hard to know who I am, exactly, and what defines me. When I finished my bracelet last night, the instructor told me I am a natural. It couldn’t have come at a better time, to help me redefine who I am and what I’m good at. A natural. Not a B- student. No admonition that my intuitions are wrong, but proof positive that they can be right in the physical objects I can wear on my body. A moment each week to focus on the metal and forget my MA. A minor obsession with handmade jewellery is gathering steam, and I’m trying my hand at chain maille. Leaning on my new callouses, which aren’t truly hard enough yet. I’m budgeting for tools and metal to work at home. I’m no longer a beginner. The intermediate silver course begins on March 6, and I can’t wait. With special thanks to Linda and Vannetta, at the School of Jewellery Design in Islington. the jewelry is truly beautiful! I agree you are a natural there. Have to say, I love the logic expression…. ! ‘Love’ is a strong word. ‘Can tolerate’ is better for me. I’m actually not bad at predicate logic, it’s just annoying. I can’t comment on logic or the MA but I know great pieces of jewellery when I see them.